Maria da Costa, is an innovative diamond jewelry designer and dealer since 1998. She is a trained, certified and experienced interior designer and a graduate of Belgium's famed HRD diamond grading training. With an active involvement in the local art scene and as an accomplished creator in several fields of the visual arts, Maria proceeded to create some of the most daring and stunning tension ring designs in the newly adopted media; such as Titanium and Zirconium. Maria is presently the House Guest Designer at Absolute Titanium Design and design Consultant at Igloo Diamonds . 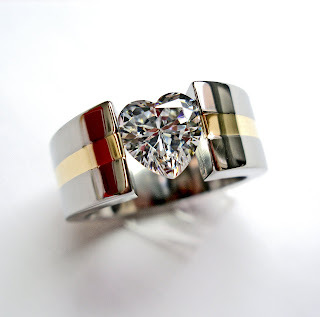 Canadian Diamonds: Fair Trade diamonds or Conflict Free diamonds? Are Fair Trade products fair? Are conflict free diamonds actually conflict-free? Fair trade diamonds may or may not reach your screen, shop or home that fast if you expect them to be fair-trade certified. 2. The community implicated in those stages of the product's creation further benefits from the acquisition of the product through a premium on its retail that pays for an improvement in the community's welfare. If it were up to the first condition alone, all Canadian diamonds would have qualified for certification as labour conditions in Canada are progressive and apply to all workers regardless of community affiliation, geographical location or otherwise. The catch is the second condition. There is no premium directed by retailers towards benefiting those implicated in the mining and processing of diamonds in Canada. Is any of them is close in spirit to the fair-trade certification concept? There is one company that stands out as the closest, it seems. If any, Igloo Diamonds appears to be it .Igloo Diamonds allocate a hefty donation from the actual markup of the sale of each and every diamond to the clearing of a plot within a minefield in Mozambique in Africa. Unlike others that might allocate "5% of the profit" to a cause (and don't we all know, as does the tax man, that 'profit' is a very fluid word, a term of bookkeeping, that might be tantamount to nothing through creative accounting-) here is an actual donation per sale. Igloo do it C/o the UN affiliate of "Adopt-a-Minefield" and the diamond and its buyer are granted also a certificate and a map, indicating the plot's size and location. All the diamonds are Canadian Diamonds, with a certificate of Canadian Origin. They seem to be the world's first pro-actively ethical diamonds. You cannot get any closer to the spirit of the fair-trade movement in the diamond world than Igloo Diamonds, indeed. Attempts are under way to create a "true" (read: "certifiable") fair-trade product in Africa through support of local, artisanal diamond mining. The catch there is the remoteness of the source in a hostile environment. Hostile in terms of safety, opposing local business-interest and warlords, unstable and/or corrupt regimes, at times of loose or no control over the source area, with no law-and-order-enforcement capabilities, or with limited or corrupt ones. Quantity of yield is, of course, another issue. One thing cannot be denied: the example of Igloo Diamonds embodies the closest one gets to a bona-fide Fair-Trade product in the diamond world, and the good they do in Africa through a reputable international organization is undeniable either.